Many congratulations to Karen and Rob who were married at the very lovely Hintlesham Hall, in Suffolk. They chose to have a 4 tier wedding cake, 2 real tiers consisting of Dark Chocolate as the 3rd tier and White Chocolate and Passion Fruit for the bottom tier. The top two tiers were dummy cakes. 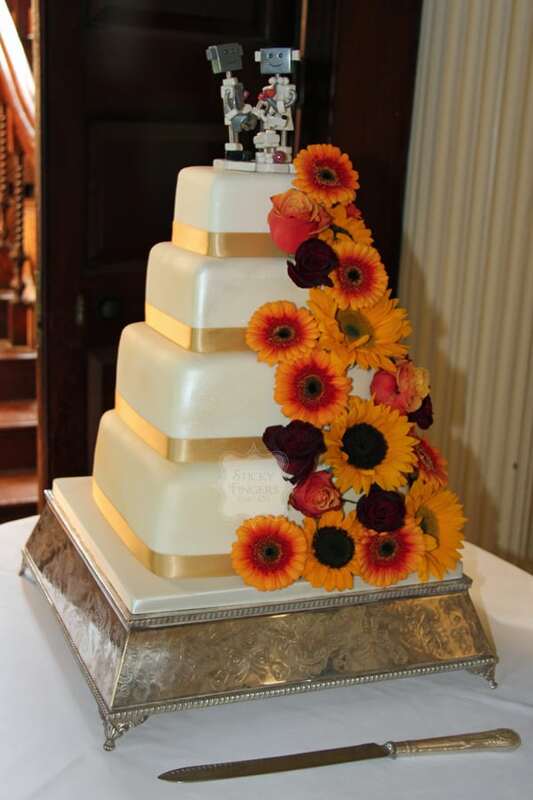 I decorated the cake with fresh flowers supplied by the happy couple’s florist; Sunflowers and brightly coloured mini gerbera, and sprayed the ivory icing lightly with an edible gold lustre to give it some sparkle! The wedding cake was topped off by their cute robot couple cake topper which matched all their wedding stationery.